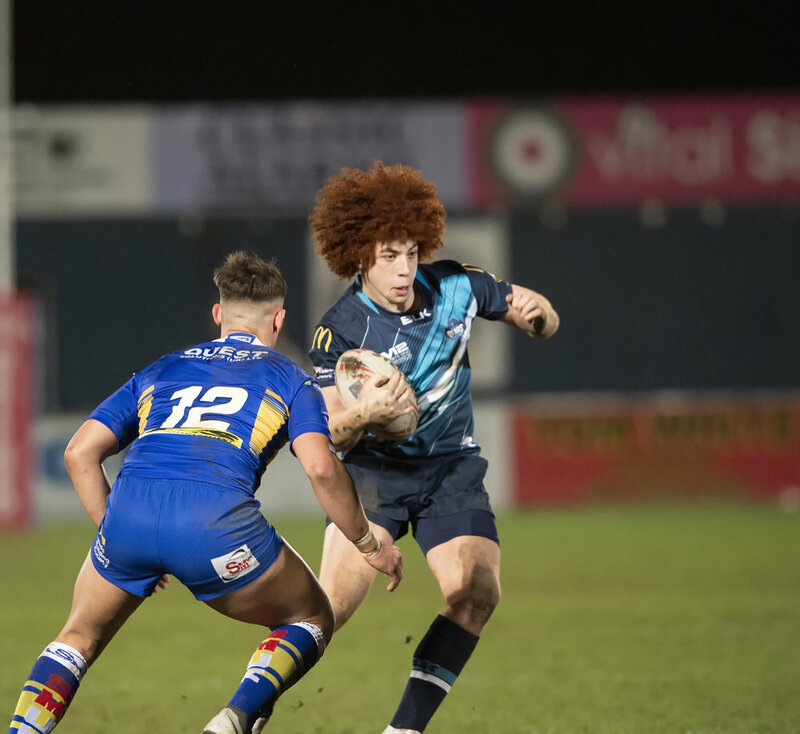 On Friday night, the Butts Park lights were on, the cameras were running as the game was being streamed live across the globe, and for those 866 rugby league fans who turned up there was certainly plenty of action. And some pretty awful weather too but that didn’t detract from the enjoyment. 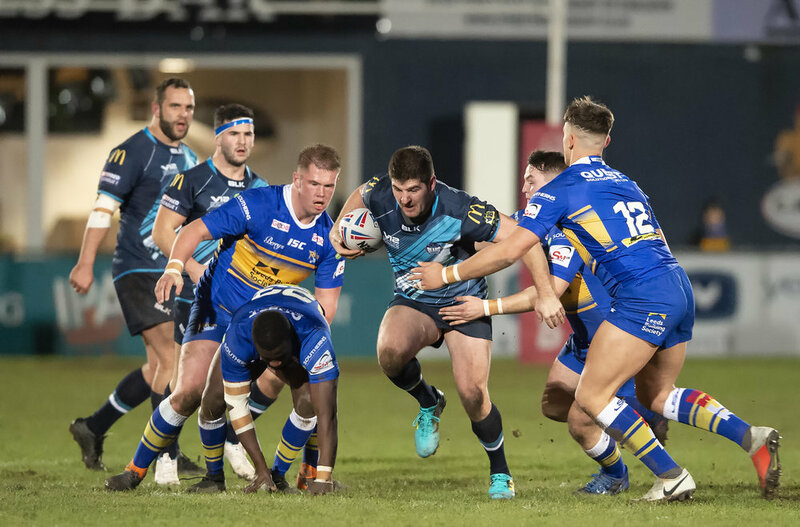 The visitors were Leeds Rhinos who travelled down to Coventry for a re-run of last years friendly, where the margin had been 42 points in favour of the Super League outfit, itself a considerable improvement over the previous 102 point margin [back in 1913]. Could Tom Tsang’s team narrow the gap again? 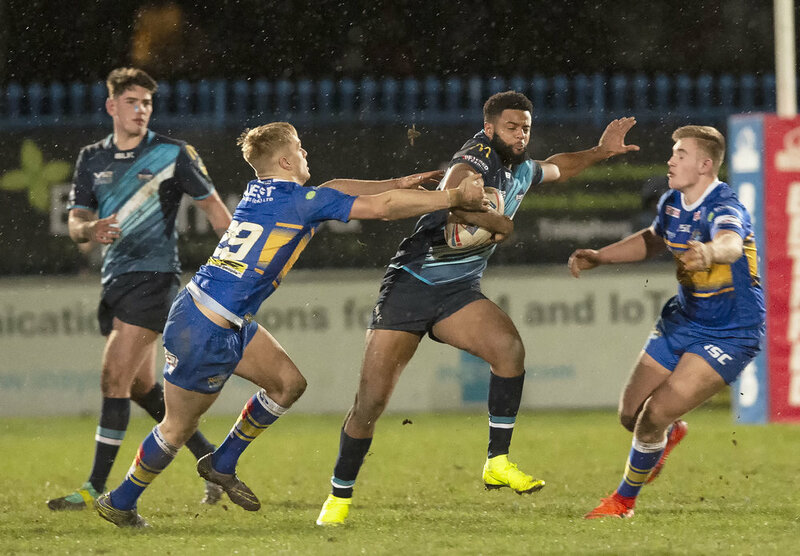 The answer was an emphatic ‘yes’ and this time both clubs and sets of supporters had good cause to feel happy; Rhinos because they fielded a young team, primarily under 19s who proved up to the task, and Coventry because the team gelled and played well for 80 minutes, losing out narrowly. That this was to be a seriously fought encounter was soon evident as the Bears pounced on the ball after a Leeds fumble, to a big cheer from the partisan home crowd. The Rhinos visibly grew in strength, stringing together a succession of passes and then defending and tackling hard when the Bears had the ball. Then at the other end the Bears came close to breaking through before eventually breaching the Leeds defence on the left as Hayden Freeman crossed the line on the far left. The conversion was not forthcoming, but the Bears were back in the game. They now entered a period of supremacy, with Dante Morley-Samuels in the thick of much of the action. Twice they were held up over the line before Will Tully barged over past four Rhinos defenders, and fellow new recruit Aussie Nick Newman converted to put the home side in the lead. This spurred Leeds and they piled on the pressure before Owen Trout’s try put the sides level and Spence’s conversion edged the visitors two points in front. This was a tight game. Now it was the Bears turn to turn up the heat, laying siege to the Rhinos try line which they attacked with driving runs, high kicks and passes out wide before a neat grubber kick was seized upon by Jacob Jones and the Bears third try. Newman added the extras and the score stood at 16-12, and that was how it stood at half time despite Leeds valiant efforts to keep the ball alive after the hooter had sounded. Fans were still making their way back to their seats when Liam Whitton sprinted over to bring Leeds level over on the left wing. The missed conversion meant the scores were now level. But to Butts Park regulars, a sense of forboding was felt, as last years game saw Leeds score almost at will in the second half. By now the weather was taking a turn for the worse, with driving rain turning to sleet and snow, but a fascinating and still close game was unfolding on the pitch. The Bears were giving as good as they were getting. 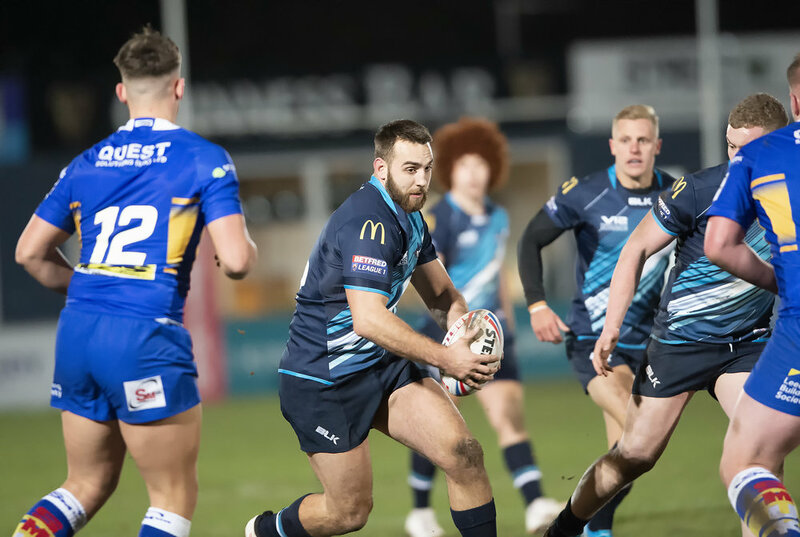 But then, as the midway point of the second half approached, Leeds’ Joe Burton helped his side to the lead for the third and final time with a try on the right hand side, again the conditions making the conversion difficult. The scoreline stayed at 16-20 despite the efforts of both sides who each demonstrated a range of tactics in an attempt to seal or pull back the game, and as the final hooter went, a close and entertaining contest came to an end. The TV viewers from Canada to Australia had witnessed another little piece of RL history, and Bears fans left the game with a distinct feeling that this season will be better than the last.